There is no Proselytism. Participative contributions will be accepted. Just want to be clear from the start. I would like you to understand right at the outset of Origin of the Universe–there is absolutely no intent at proselytism on behalf of the author. I’ve stated and restate, I belong to no group, no Church, no religious organization. I have no intention of joining anything or anyone and certainly not of establishing any organization. My sole intent for writing The Explanation series of books is because I see a void in understanding the relationship between the world we live in with its day-to-day chores and challenges and the desire humankind has to know if there’s more to life than meets the physical eye. Is there ‘something/someone’ bigger than us out there? You can call it god, God, spirits, ghosts, extraterrestrial beings, angels, demons–whatever you want. Is there some tie-in between the invisible (to humankind) and visible worlds? I spent twenty-five years in the Christian ministry and in 1997 left the fulltime ministry for personal reasons. At the same time, the Worldwide Church of God exploded into a few major branches and literally hundreds of doctinal fragments. Personally, I floundered around, obliged to focus on my professional life, but soon I found myself trying to make heads and tails of my spiritual life. It was at this point that the idea of writing began to germ. However, there are so many commentaries and interpretations of the Bible and particularly the book of Genesis that I didn’t want to follow the crowd. I’d already used the Biblical Hebrew approach during my Ministry and it was effective in teaching and opening a new vista on the Bible. I spent a couple of years taking online Biblical Hebrew with what was called eTeacherHebrew and is now the Israel Institute of Biblical Studies. I needed first-rate verification that the study method I was using is valid. And I now realize it is 100% valid. Teaching and using Biblical Hebrew as the basis of understanding of Genesis and the Old Testament, and even associated with the Greek New Testament unlocks Bible meaning. There are a multitude of biblical meanings that are impossible to understand in any and all translations. Yes, that’s quite a statement. But, I guarantee you that–although you’ll grasp the basics of the Bible in a translation–you’ll miss the profound meaning of its authors–indeed, maybe its Author–I say ‘maybe’ for those who don’t believe–which I understand. 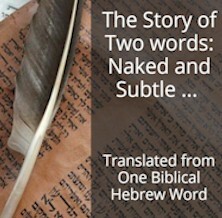 If you’re into Bible study, you’ve certainly seen Biblical Hebrew used is some way. But you haven’t seen the method that I teach and use to expound scripture–that’s what this book Origin of the Universe is based on. I repeat, you can rest at ease, no proselytism–take it or leave it–it’s up to you. At the most there’ll be a group or community for those who want to be informed of the material I’ll be covering in these follow-on books (there are another four basically already written) and my Unlock Bible Meaning via Biblical Hebrew courses which are available at www.TheExplanation.com. It is likely there’ll be online presentations, Bible webinars (which I’m calling ‘biblars’), podcasts, classes and discussion groups or Q&A sessions and other activities along that line. But there will be no religious services of any kind. These activities will take place on internet which covers both geographical location and time zone considerations as well as continuity of materials for anytime-consultation. Be assured that each individual is totally free to follow their own convictions, including myself following my own convictions. Whether you like or dislike, adhere to or reject any of the explanations that will result from the reading and study in these books is entirely up to you. Anyone is free to participate or drop out of further reading or participation. The only behavior I request is respectful participation and constructive commentary. One final word regarding finances. All the material used for publication of The Explanation series is available totally free of charge in digital format at www.TheExplanation.com. When it comes to the availability of this same material via any commercial sites, like Amazon, both digitally and physically (printed works) there is a cost and hence a purchase price. These commercial sites do recompense authors, in this case myself, with a portion of the payment. The portion that returns to Sam Kneller is used exclusively for publication and propagation of The Explanation. All financing of this work has been via personal finances. I have given much thought to the concept of contributions and have decided to accept them from those who wish to participate in the effort put into The Explanation. Let me assure you that any such contributions via the website www.TheExplantion.com will solely be used in the publication and dissemination of The Explanation. I thank those people and appreciate their participative efforts. I will shortly be setting up a WordPress add-on to manage contributions via Paypal. Since The Explanation does not have the official status for accepting contributions there can be no tax deductions–unfortunately. You can contribute to The Explanation by clicking here. It is much appreciated and I thank you. This blog post is an excerpt from the Preface and Notes 2 of Origin of the Universe.